In the past, I’ve had my fair share of annoying ‘wireless’ gaming headsets. Battery life and connectivity have always been issues I’ve encountered so I tend to avoid these types of headsets. When Plantronics revealed the RIG 800HS, the company promised to combat the common issues found with wireless gaming headsets. I was still sceptical however with some personal positive experience with some of their lifestyle products – like the Plantronics BackBeat earphones,I was keen to see what Plantronics can potentially bring to the gaming table. 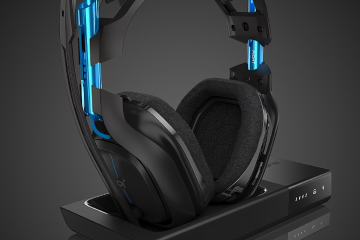 The Plantronics RIG 800HS carries the RIG branding and joins their extensive line-up of gaming headsets. While it looks almost identical to the RIG 500 series, the RIG 800HS is it’s own beast taking the comfortability and design up a notch. Wireless headsets tend to be quite weighty in comparison to normal gaming headsets because of the added things like battery and onboard controls. Despite having all these features still, the Plantronics RIG 800HS is surprisingly light and feels almost weightless which is somewhat of an incredible feat. I’ve always preferred the RIG series from Plantronics because of the weight, using them on the go and it’s good to see the bigger brother – the Plantronics RIG 800HS carry that same feature. One of the biggest selling point of the Plantronics RIG 800HS is the battery life. Plantronics are claiming the RIG 800HS lasts up to 24-hour on a single battery charge. While I didn’t test a single complete 24-hour session (don’t try this at home – you’ll probably die) the battery lasted up 4-5 days with usage of up to 4-5 hours every day. That’s impressive and way better than any other wireless gaming headsets I’ve used. Charging however, does take a while with up to 3-4 hours to juice up the Plantronics RIG 800HS again which is one of the biggest flaws but with a battery life THAT long – I guess it has to come with some sacrifices. I’ve also tested the range of the wireless in two scenarios, in the lounge room on the PS4 and on the PC in the office with both turning out expectedly well. I could be behind two walls away and the Plantronics RIG 800HS still continues to pump so the range is definitely more than enough for the average consumer. While Plantronics has nailed almost every ‘wireless’ gaming headset issue with the Plantronics RIG 800HS, the audio was surprising not up to par for the price point. While the RIG 800HS delivers on comfort and design, I found the audio quality to be lacking. It’s great but not incredible and does the job for your standard video-games. I played Call of Duty: Infinite Warfare on the PS4 to test out the gameplay on the Plantronics RIG 800HS. While it’s not a surround sound headset, it was perfectly fine and sharp to pin-point accurate fire and movements in-game. When it comes to movies and music or say atmospheric games like Horizon Zero Dawn, this is where you’ll notice the audio struggle when compared with other gaming headsets out there. Even with the four pre-set EQ settings, it was hard to move down from a surround sound headset to something like the Plantronics RIG 800HS. I’ve also tested the microphone for a bit, like many other gaming headsets – it just does the job and something I won’t use for producing things like videos. Overall, the Plantronics RIG 800HS is a great wireless gaming headset. If you prefer the wireless gaming freedom the headset can provide, it might be something for you but with the sacrifice of quality audio. Disclaimer: A review sample was provided by Plantronics | Respawn Ninja is owned by Mwave Australia, however we retain editorial control over reviews.